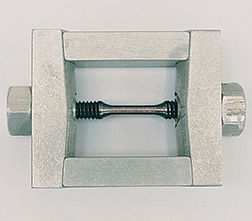 The ASTM G49 Test Fixture is used to evaluate stress on a 1/8" round tensile specimen. The fixture is comprised of two assemblies, the loading fixture (P/N TF5201) and the stress frame (P/N TF2430). The stress frame is purchased separately. The test specimen is not included.